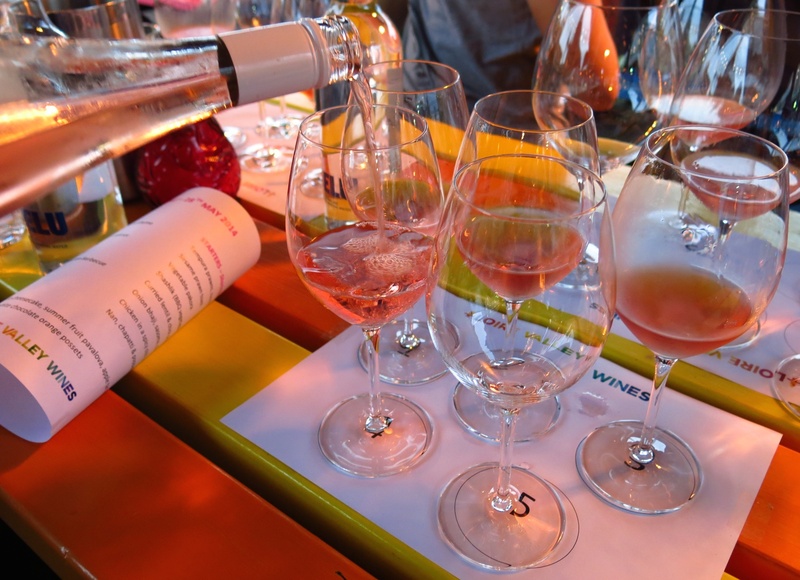 Dozens of food and wine writers, as well as lifestyle bloggers and thirsty folks in general, are gathered on a rooftop in Shoreditch at picnic tables glittering with glass. No less than five vessels are placed in front of each seat’s occupant. 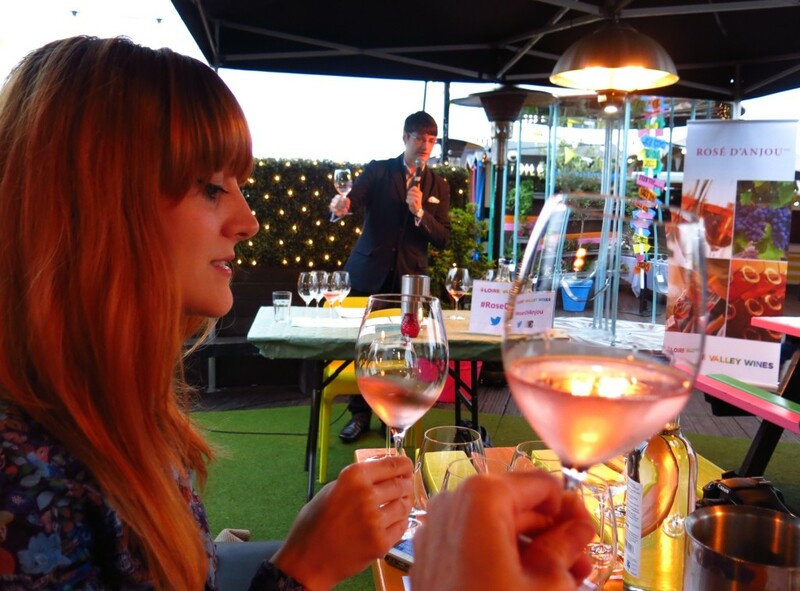 These are rapidly filling with various waterlemon shades of Rosé d’Anjou Loire Valley wines as nimble waitresses navigate their way through the impromptu, tented dining room atop the Queen of Hoxton pub. “So, how do you taste wine?” asks Blyde, who is presiding over the head table. “We could do it the English way, which is to hold the glass in an elegant manner, raise it to your mouth…and keep going,” he quips. In fact, as Blyde is about to explain, it’s not entirely that easy. So, here’s your step-by-step guide to impressing your date—and possibly even a French sommelier. Clockwise or counterclockwise—it doesn’t seem to matter, as far as I can tell–unless you’re an adherent of the Coriolis effect, which allegedly causes toilets to flush clockwise in the Southern Hemisphere and counterclockwise in the Northern Hemisphere. In which case, always swirl clockwise if you’re tasting an Australian shiraz. Okay, not really. The only rule here is to keep the vino inside the glass. You’re not going to make any friends by splashing wine, no matter how fine, across someone’s crisp white shirt. Not your date’s legs. (You can do that later by discreetly dropping your napkin under the table). At the moment, however, you’re looking for the “cathedral windows” or “legs” of the wine, which cling to the side of the glass. “The more legs you see, the merrier you will be, the higher the AVB,” Blyde explains. Hold the glass against a white background. If you ordered white wine and the liquid inside the glass is red, there’s an obvious problem. 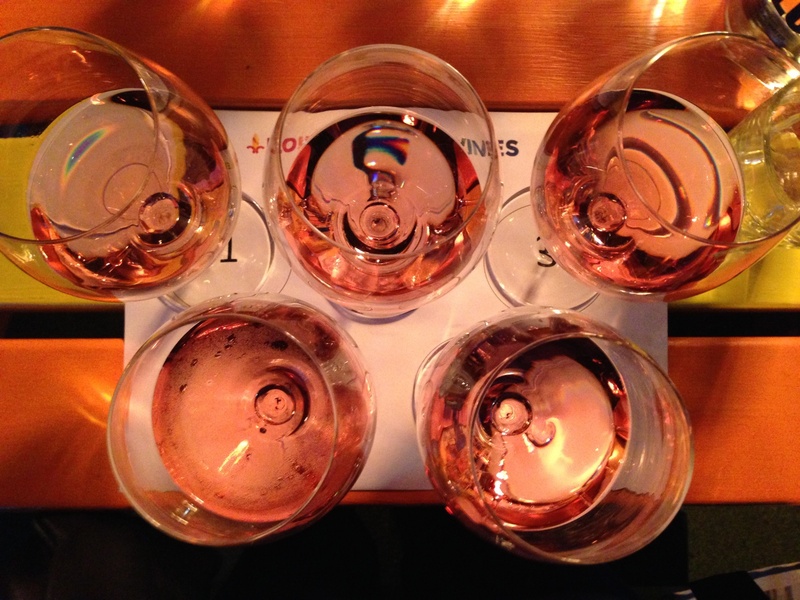 If the fluid is pink, you’re either drinking a rosé, or you’ve accidentally mixed your red together with your white. Of course, there’s more to it than that. The colour of a wine can tell you a bit about its age, as well as offer hints about how it will taste. 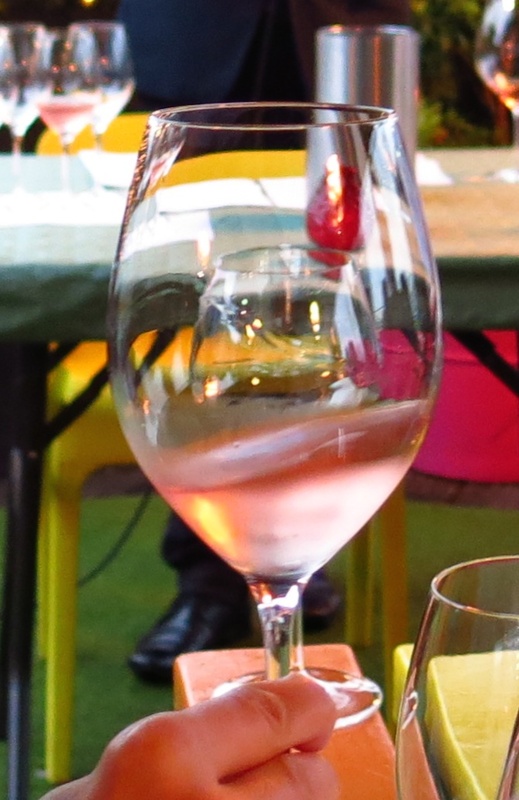 For instance, with a rosé, such as we’re drinking this evening, a deeper colour indicates that the grape skins have spent more time with the juice, potentially producing a more tannic, bolder wine. “Give it a good old sniff, like a perfume sample,” Blyde suggests. What aromas do you detect? Waterlemon? Strawberries? Your neighbour’s overwhelming aftershave? Note: this should not sound like you’re clearing your sinuses from last winter’s cold. Keep it discreet, people. There’s really no other way of saying it. Wait…maybe there is. “Aerate the wine with your tongue.” It’s hard to describe, but it might help if you pretend that you’re from the House of Slytherin. “Draw 12 seconds of air,” Blyde instructs, before drawing about five seconds of air—and unceremoniously choking. I didn’t think you really wanted to see a photo of someone slurping. How about another pic of this lovely pink nectar instead? I’m fairly certain this requires no instruction. If it does, then put the glass down, carefully. You’ve already had quite enough there, buddy. 7. Repeat, omitting steps 1-5. Check out Douglas Blyde’s food, wine and spirits reviews, as well as his travel adventures: www.intoxicatingprose.com. For updates on the Queen of Hoxton’s special events: www.queenofhoxton.com. 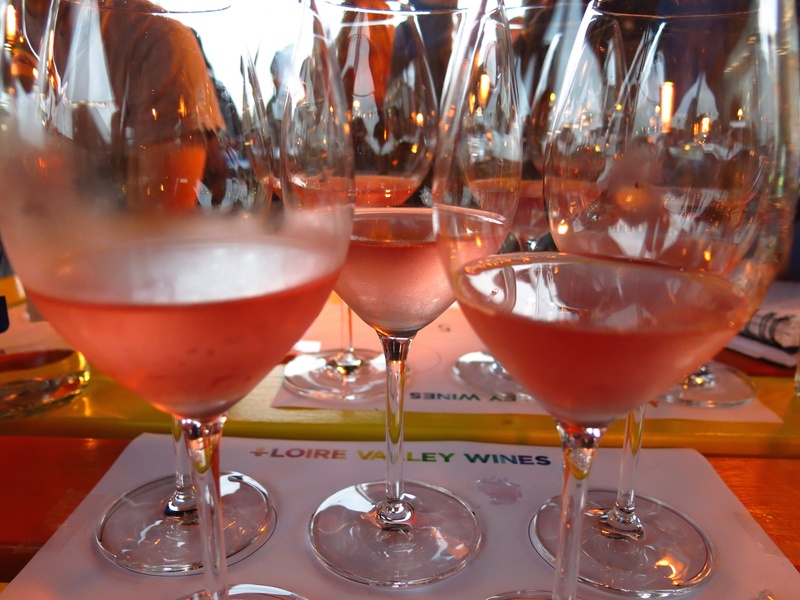 Learn about Rosé d’Anjou Loire Valley wines: http://loirevalleywine.com/regions/anjou/rose-danjou. ← Cheese-Rolling Competition in Gloucestershire, England. That’s just crackers! Too funny and extremely informative. Good thing I wasn’t drinking wine when I read this. I would have ungraciously spit it out on someone’s white shirt laughing. Now, I will properly enjoy a glass of wine, right now, please. Ha! Don’t worry; the pros spit out their wine all the time. They just pretend to do it on purpose. Thanks so much for your comments! I’m usually such a klutz with a wine glass that one of my friends requires me to drink from a sippy cup at her parties. (True story). But maybe with my new “skilz,” I’ll convince her that I’ve graduated to a grown-up glass…without a lid. an EXCELLENT recount of the affair; I’d all but forgotten these steps, because – as it turns out, I’m quite ‘English’ about my drinking! Loved these steps and the comedic “legs”. To be honest I have taken many wine classes but do not do the steps when on a date for fear of being quite pretentious! I safe all my pretentiousness for home use only!! !